Lot 1 A late Georgian diamond ring. 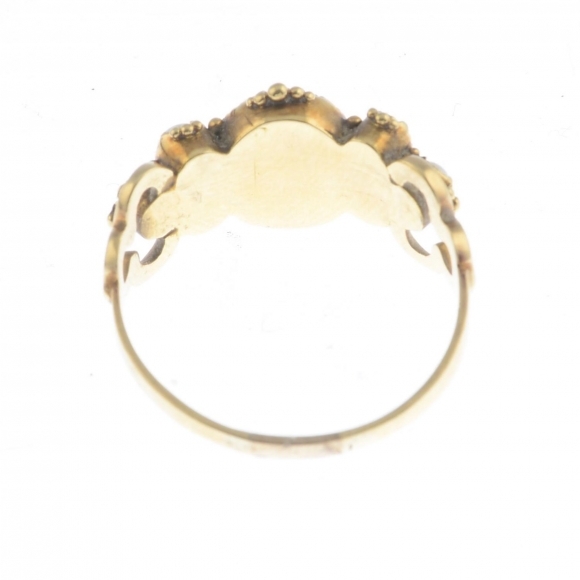 The rose-cut diamond floral panel, to the later replacement band, with openwork stylised foliate shoulders. Ring size L. Weight 6.3gms. A late Georgian diamond ring. The rose-cut diamond floral panel, to the later replacement band, with openwork stylised foliate shoulders. Ring size L. Weight 6.3gms. 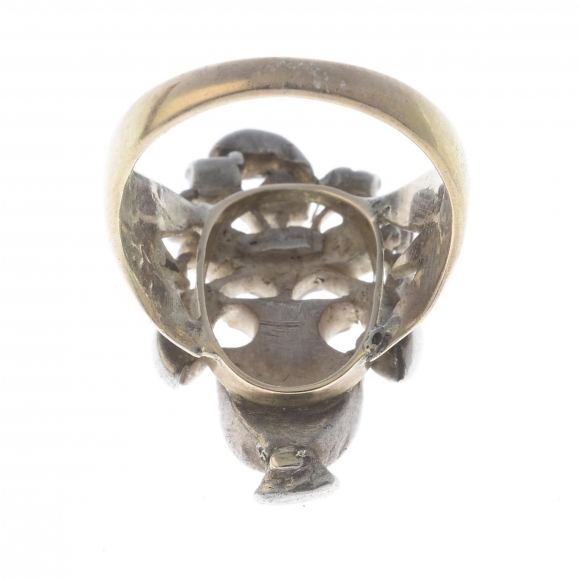 Lot 2 An early 20th century silver gem-set ring. 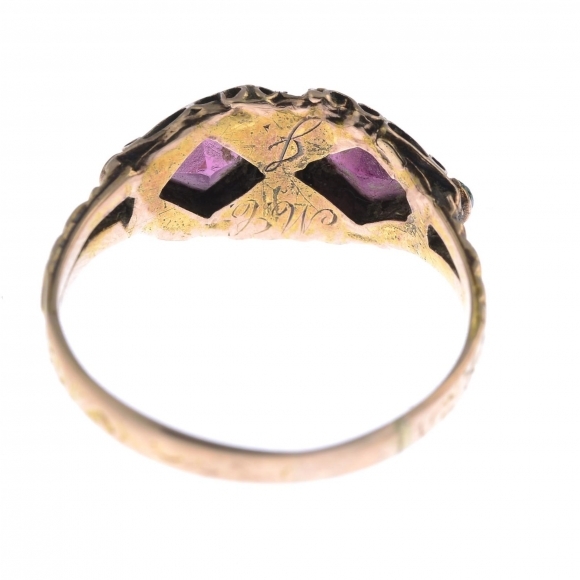 Of openwork design, the pear-shape pink tourmaline collet, with ruby, marcasite and green gem foliate surround, to the replacement Georgian scrolling band. 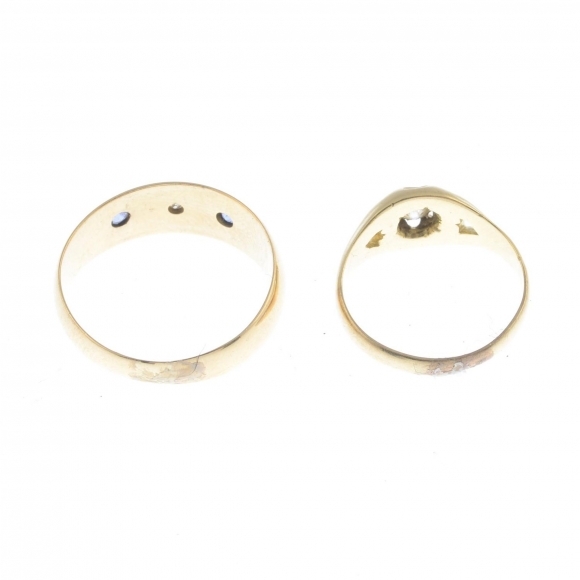 Approximate ring size L. Weight 2.3gms. 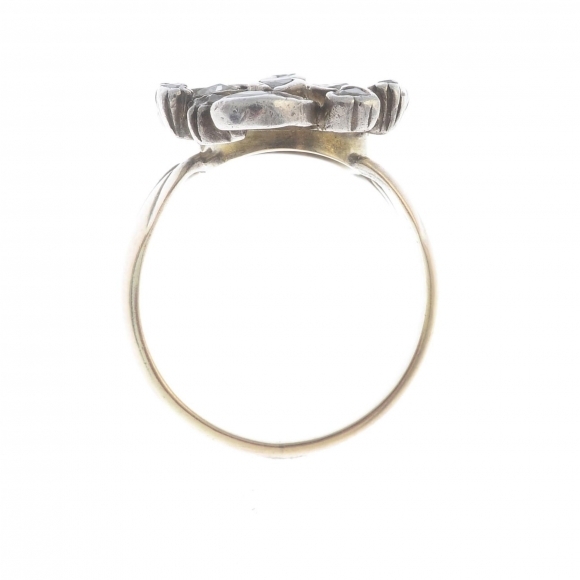 An early 20th century silver gem-set ring. 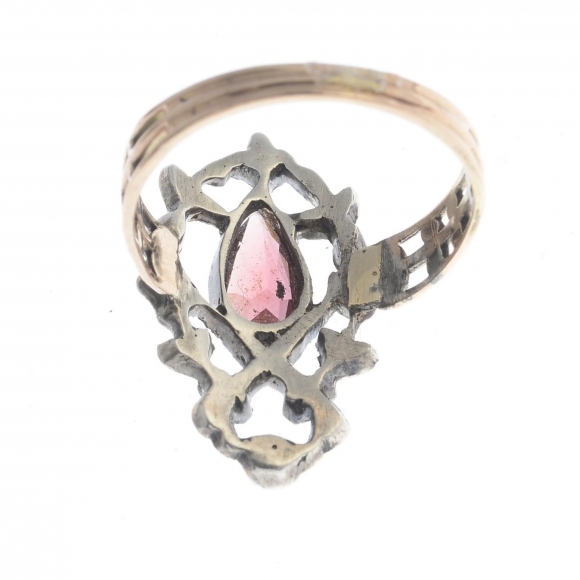 Of openwork design, the pear-shape pink tourmaline collet, with ruby, marcasite and green gem foliate surround, to the replacement Georgian scrolling band. 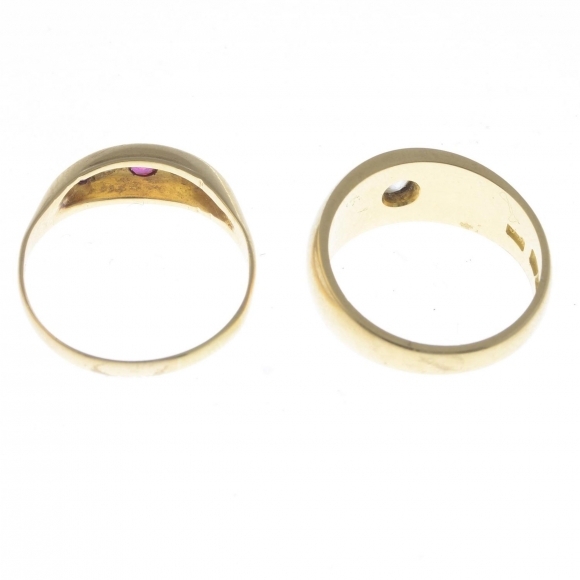 Approximate ring size L. Weight 2.3gms. Lot 3 A tanzanite and diamond pendant. 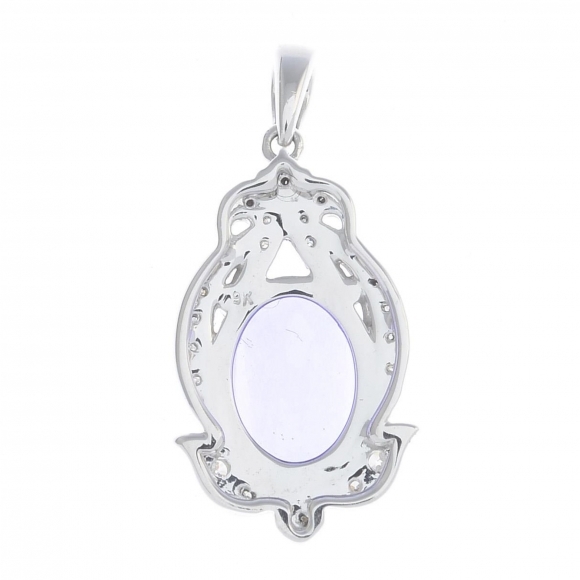 The oval-shape tanzanite, with brilliant-cut diamond scrolling surround. Estimated total diamond weight 0.30ct. Marks to indicate 9ct gold. Length 2.4cms. Weight 2.3gms. A tanzanite and diamond pendant. 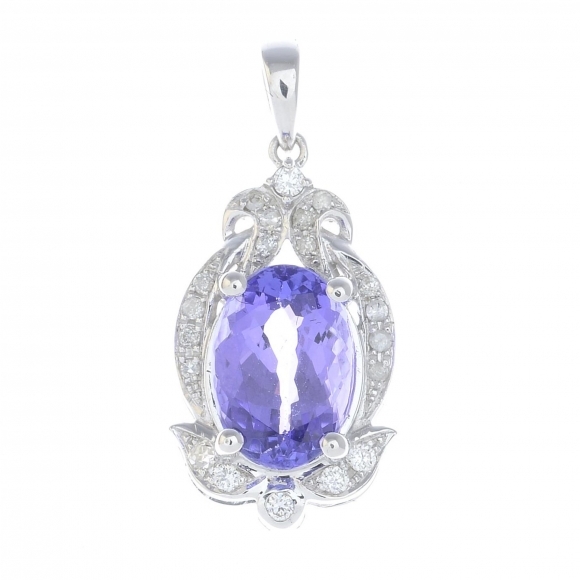 The oval-shape tanzanite, with brilliant-cut diamond scrolling surround. Estimated total diamond weight 0.30ct. Marks to indicate 9ct gold. Length 2.4cms. Weight 2.3gms. Lot 4 A pair of zircon and diamond cluster earrings. 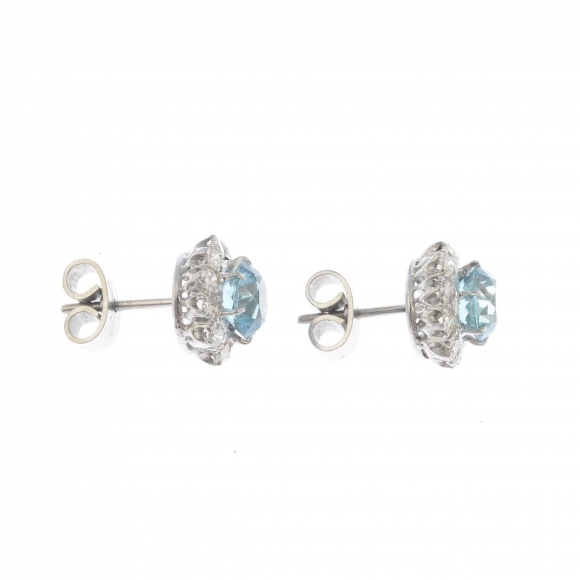 Each designed as a circular-shape blue zircon, with brilliant-cut diamond surround. Estimated total diamond weight 0.65ct. Diameter 1cm. Weight 3.1gms. A pair of zircon and diamond cluster earrings. 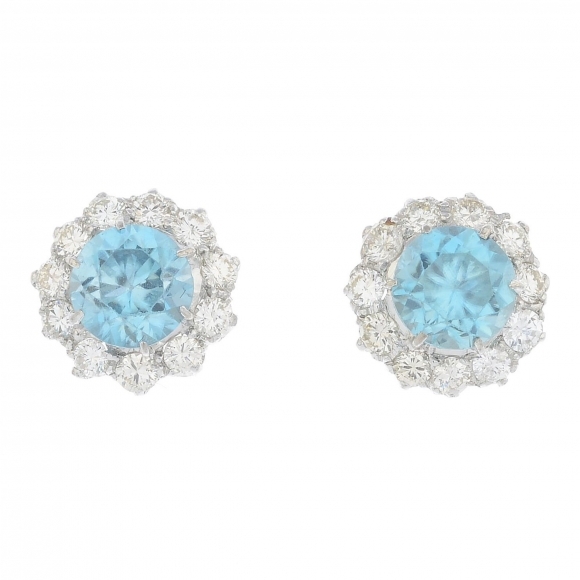 Each designed as a circular-shape blue zircon, with brilliant-cut diamond surround. Estimated total diamond weight 0.65ct. Diameter 1cm. Weight 3.1gms. 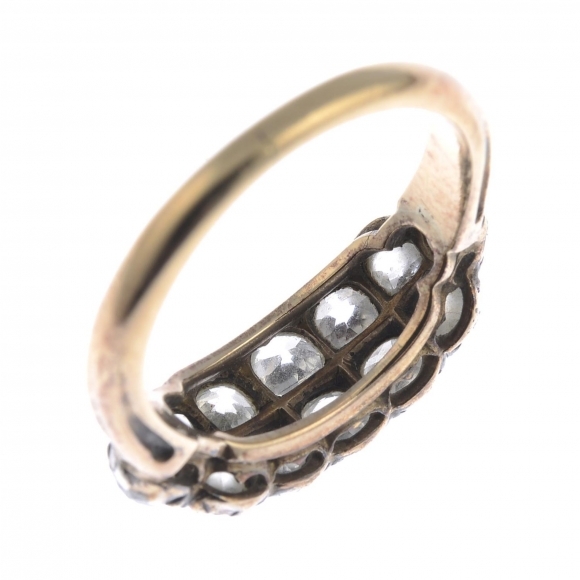 Lot 5 A late Victorian 18ct gold diamond five-stone ring. Designed as a graduated old-cut diamond line, with rose-cut diamond double spacers and scrolling gallery. Estimated total old-cut diamond weight 1ct, I-J colour, P1 clarity. Ring size R. Weight 2.6gms. 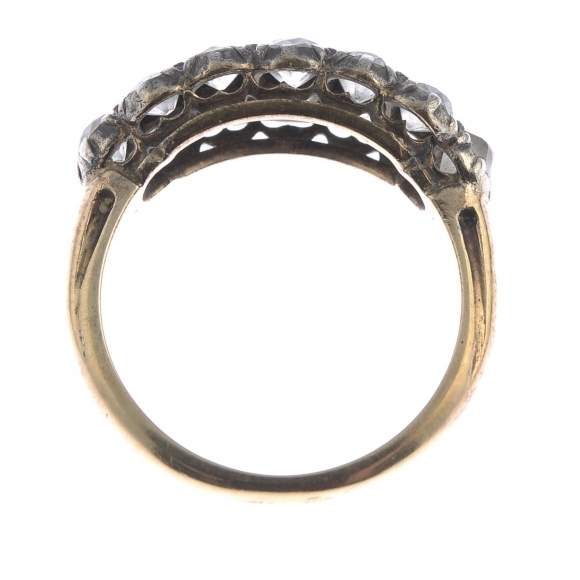 A late Victorian 18ct gold diamond five-stone ring. Designed as a graduated old-cut diamond line, with rose-cut diamond double spacers and scrolling gallery. Estimated total old-cut diamond weight 1ct, I-J colour, P1 clarity. Ring size R. Weight 2.6gms. 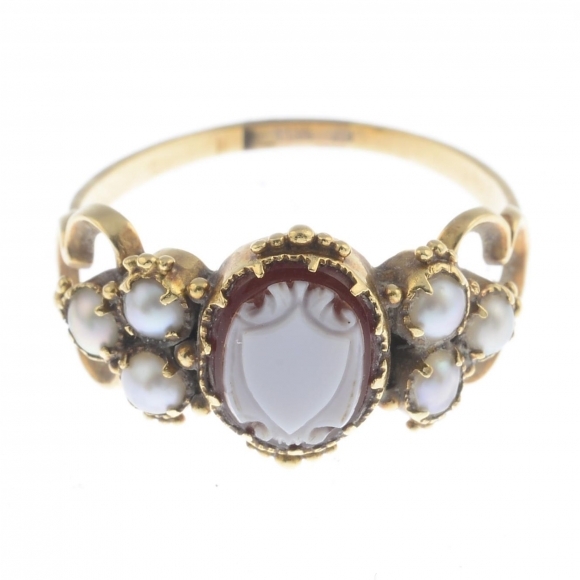 Lot 6 A mid Victorian gold sardonyx and split pearl ring. 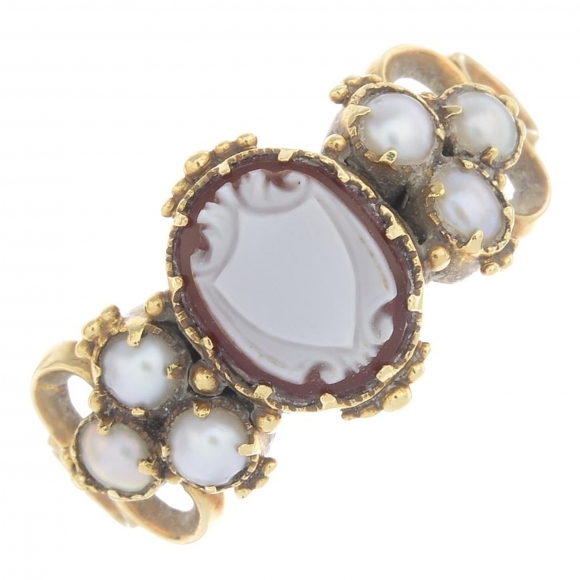 The oval agate cameo, carved to depict a shield, with split pearl trefoil sides and openwork shoulders, to the replacement band. Ring size N1/2. Weight 2.5gms. A mid Victorian gold sardonyx and split pearl ring. The oval agate cameo, carved to depict a shield, with split pearl trefoil sides and openwork shoulders, to the replacement band. Ring size N1/2. Weight 2.5gms. Lot 7 An opal and split pearl necklace. 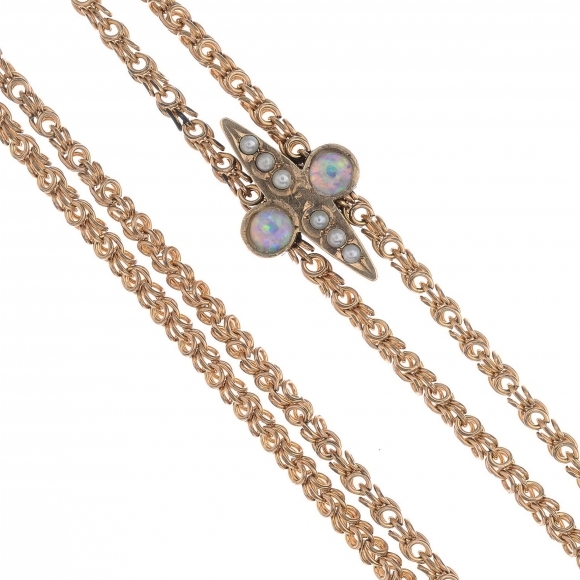 The opal and split pearl abstract panel, suspended from a fancy-link chain. Length 112cms. Weight 14.8gms. An opal and split pearl necklace. 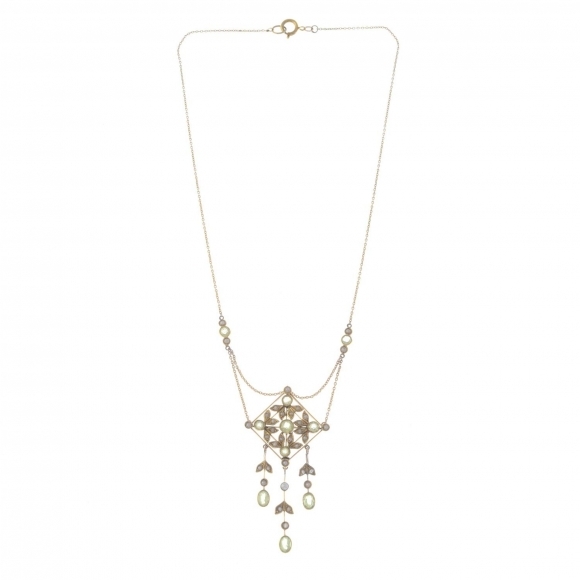 The opal and split pearl abstract panel, suspended from a fancy-link chain. Length 112cms. Weight 14.8gms. Lot 8 An Edwardian 15ct gold peridot and split pearl necklace. 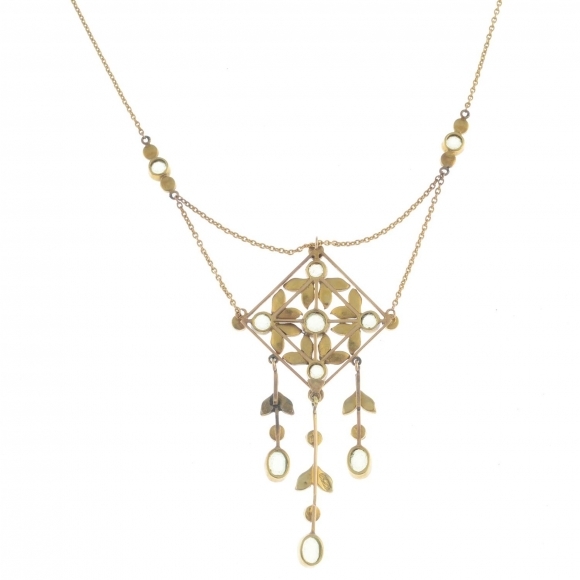 Of openwork design, the oval-shape peridot and split pearl fringe, suspended from a circular-shape peridot collet and split pearl foliate surround, to the similarly-designed peridot and split pearl swag accent integral belcher-link chain. Stamped 15ct. Length 42cms. Weight 7.4gms. An Edwardian 15ct gold peridot and split pearl necklace. 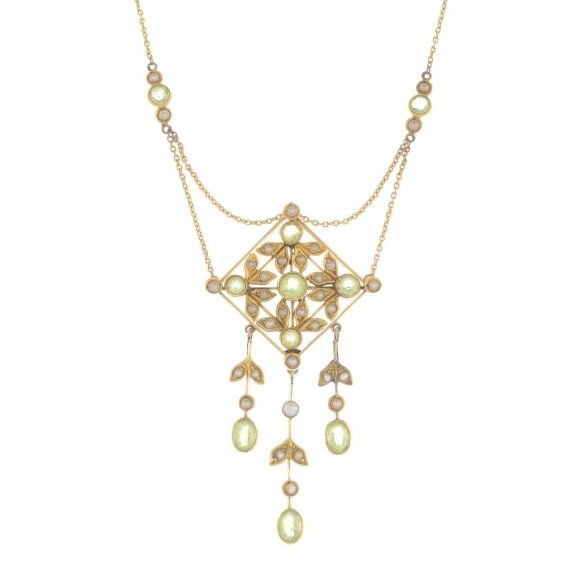 Of openwork design, the oval-shape peridot and split pearl fringe, suspended from a circular-shape peridot collet and split pearl foliate surround, to the similarly-designed peridot and split pearl swag accent integral belcher-link chain. Stamped 15ct. Length 42cms. Weight 7.4gms. 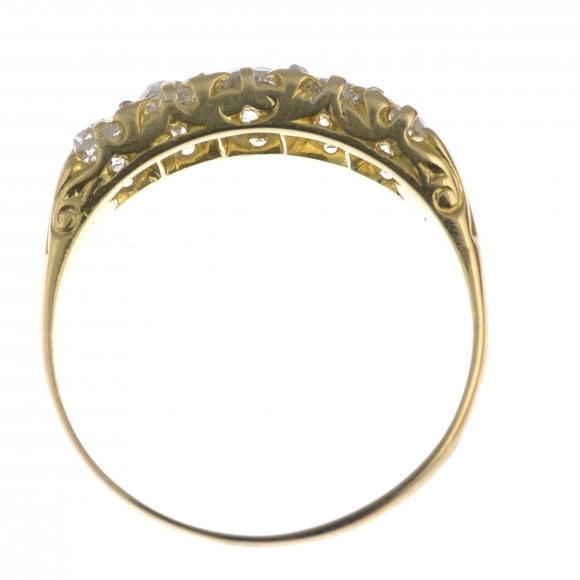 Lot 9 A late 19th century gold cultured pearl and diamond bangle. 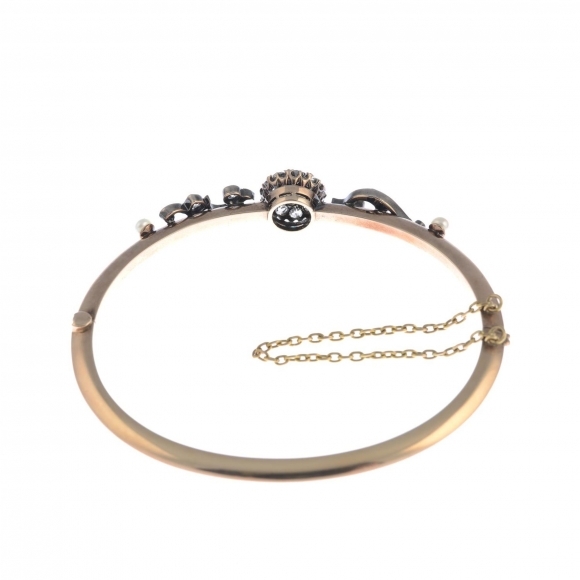 Designed as a cultured pearl and old-cut diamond cluster, with similarly-set diamond scrolling sides and cultured pearl accents, to the knife-edge half-bangle. Estimated total diamond weight 1.75cts. Inner diameter 6cms. Weight 9gms. With case. A late 19th century gold cultured pearl and diamond bangle. 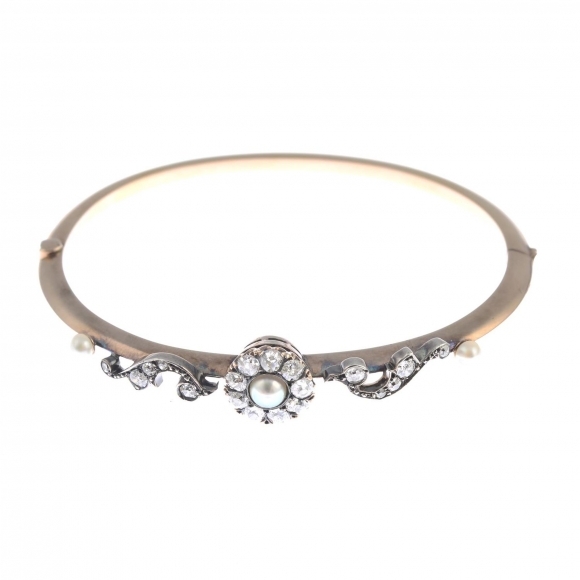 Designed as a cultured pearl and old-cut diamond cluster, with similarly-set diamond scrolling sides and cultured pearl accents, to the knife-edge half-bangle. Estimated total diamond weight 1.75cts. Inner diameter 6cms. Weight 9gms. With case. 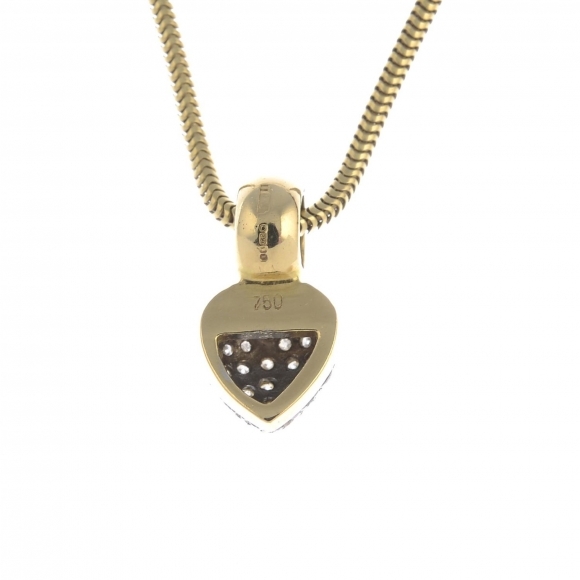 Lot 10 An 18ct gold diamond pendant. Designed as a pave-set diamond heart, suspended from a snake-link chain. Estimated total diamond weight 0.30ct. Pendant with hallmarks for 18ct gold. Chain stamped 750. Length of pendant 1.4cms. Length of chain 44cms. Total weight 7.1gms. An 18ct gold diamond pendant. 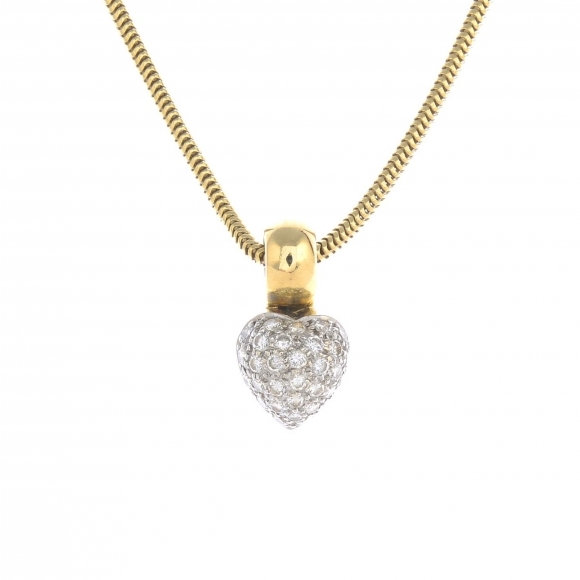 Designed as a pave-set diamond heart, suspended from a snake-link chain. Estimated total diamond weight 0.30ct. 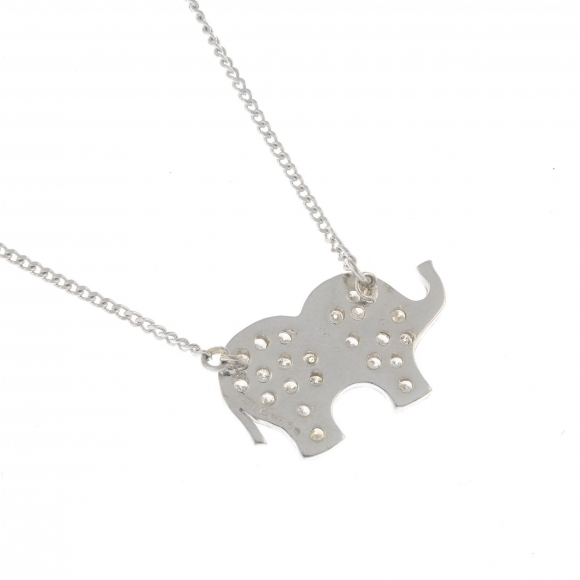 Pendant with hallmarks for 18ct gold. Chain stamped 750. Length of pendant 1.4cms. Length of chain 44cms. Total weight 7.1gms. 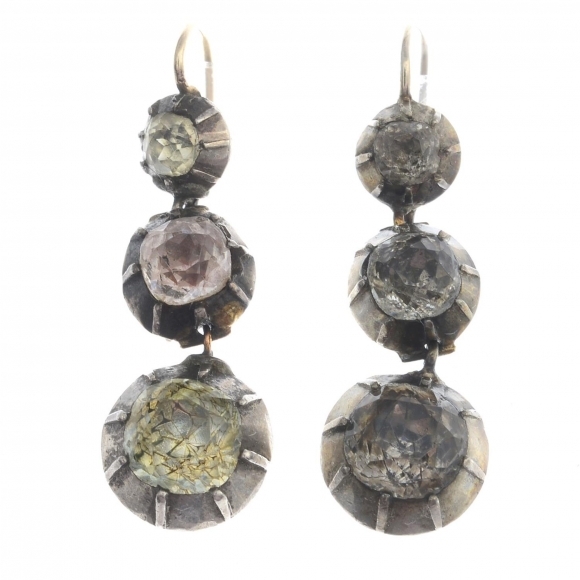 Lot 11 A pair of diamond cluster earrings. 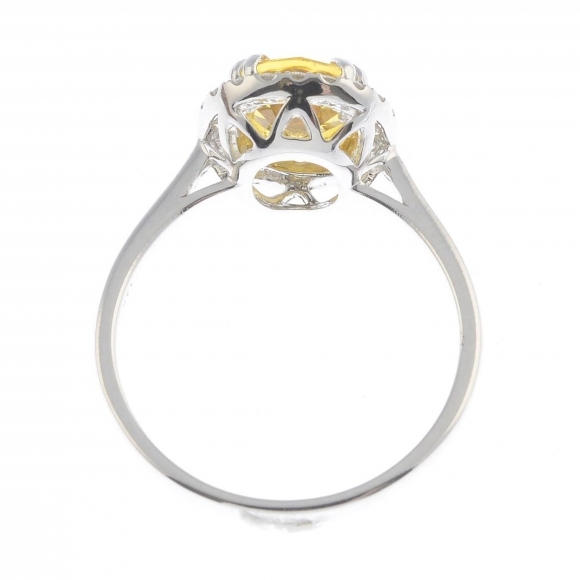 Each designed as a brilliant-cut diamond, with similarly-cut diamond surround. Principal diamonds estimated total weight 2cts, I-J colour, P1 clarity. Diameter 1cm. Weight 4.4gms. A pair of diamond cluster earrings. 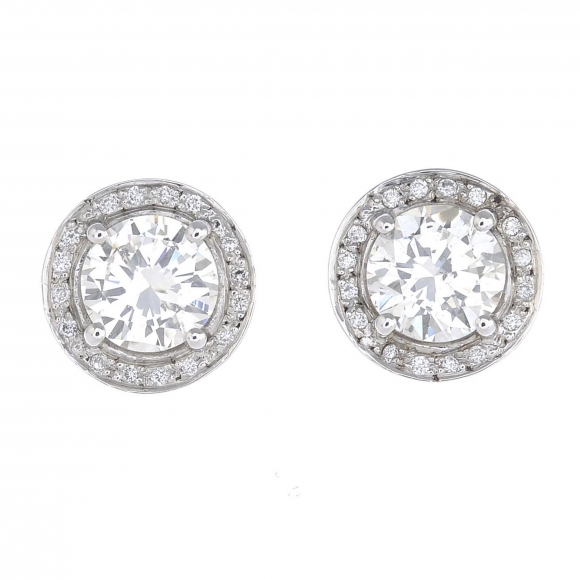 Each designed as a brilliant-cut diamond, with similarly-cut diamond surround. Principal diamonds estimated total weight 2cts, I-J colour, P1 clarity. Diameter 1cm. Weight 4.4gms. 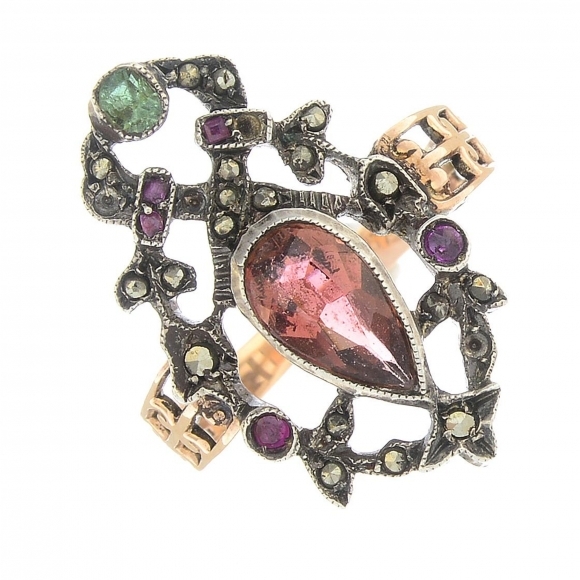 Lot 12 A mid Victorian 15ct gold garnet, emerald and split pearl ring. Designed as a kite-shape garnet duo, with split pearl double spacers and vari-shape emerald highlights, to the scrolling engraved shoulders. Hallmarks for Birmingham, partially indistinct. Ring size N1/2. Weight 1.8gms. 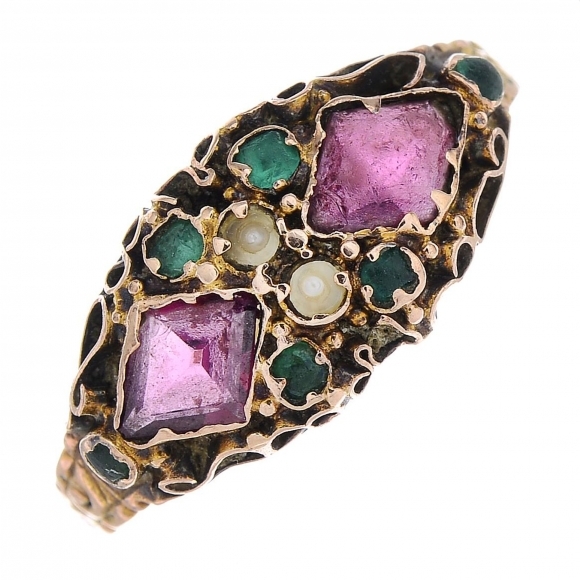 A mid Victorian 15ct gold garnet, emerald and split pearl ring. Designed as a kite-shape garnet duo, with split pearl double spacers and vari-shape emerald highlights, to the scrolling engraved shoulders. Hallmarks for Birmingham, partially indistinct. Ring size N1/2. Weight 1.8gms. 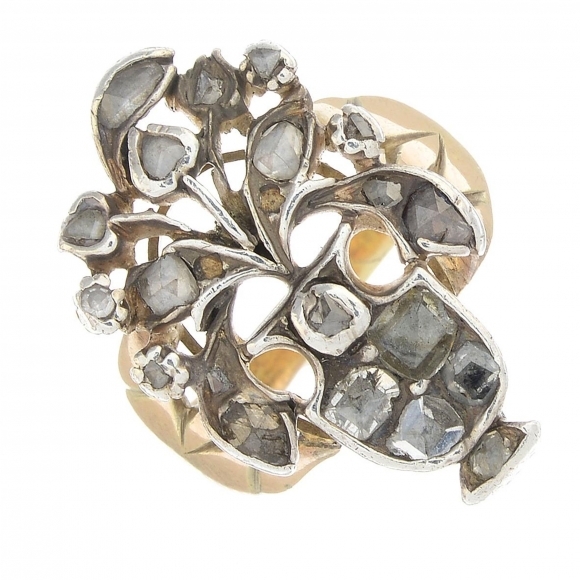 Lot 13 A sapphire and diamond cluster ring. 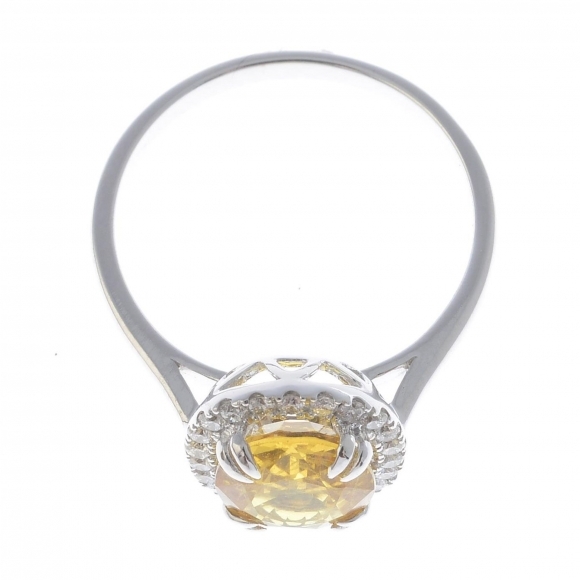 The oval-shape yellow sapphire, within a brilliant-cut diamond surround. Estimated total diamond weight 0.25ct. Marks to indicate 14ct gold. Ring size M. Weight 2.6gms. A sapphire and diamond cluster ring. 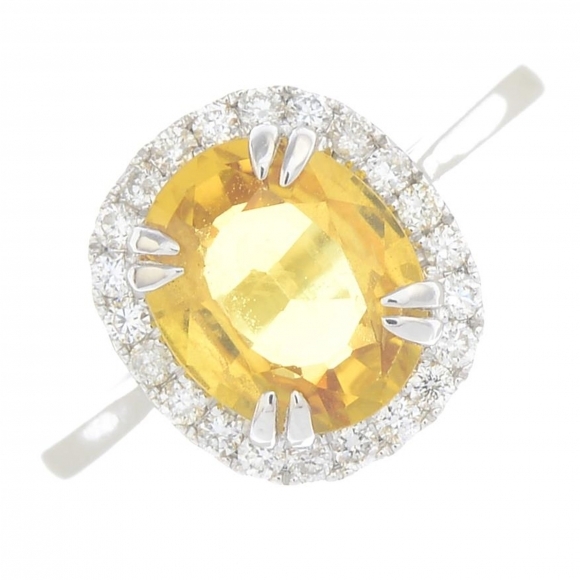 The oval-shape yellow sapphire, within a brilliant-cut diamond surround. Estimated total diamond weight 0.25ct. Marks to indicate 14ct gold. Ring size M. Weight 2.6gms. 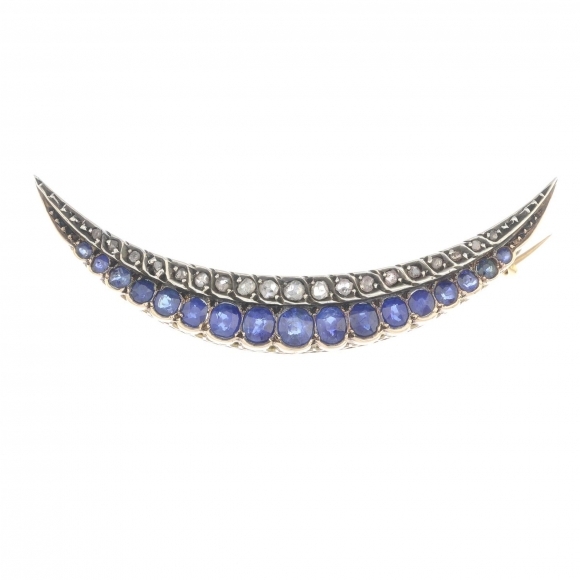 Lot 14 A late Victorian silver and 9ct gold, sapphire and diamond crescent brooch. 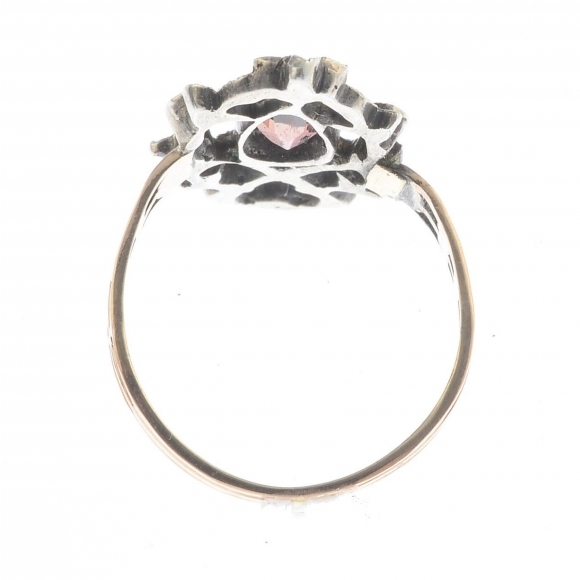 The graduated oval-shape sapphire scalloped line, with rose-cut diamond raised line surmount. Verbal from GCS, stating Basaltic, no heat. Length 5.9cms. Weight 7.8gms. A late Victorian silver and 9ct gold, sapphire and diamond crescent brooch. 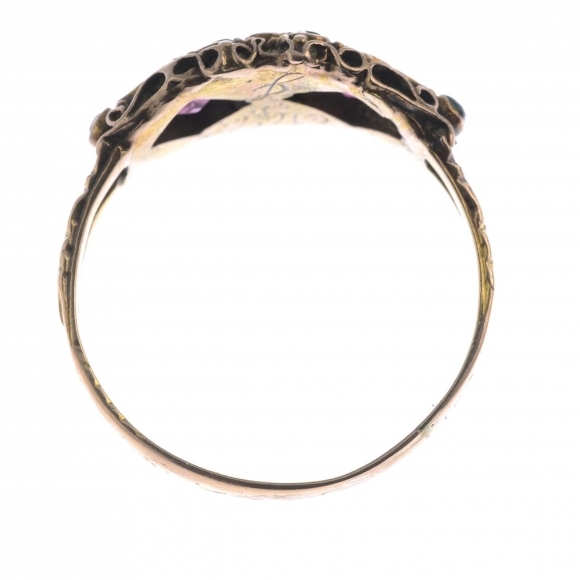 The graduated oval-shape sapphire scalloped line, with rose-cut diamond raised line surmount. Verbal from GCS, stating Basaltic, no heat. Length 5.9cms. Weight 7.8gms. 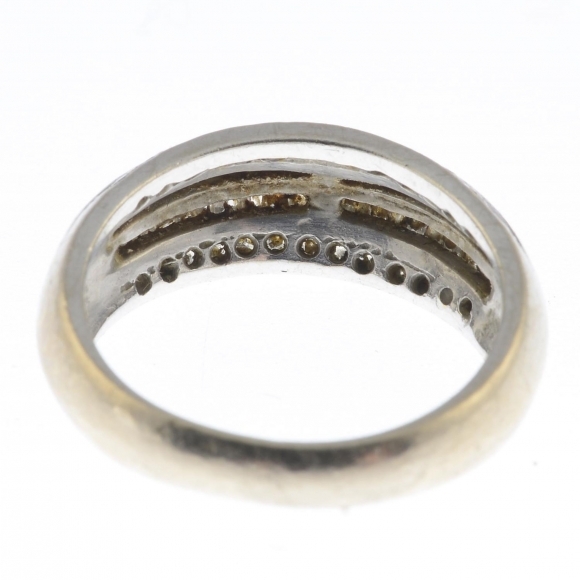 Lot 15 A mid 19th century gold and silver diamond dress ring. Designed as two old-cut diamond rows, with similarly-cut diamond terminals and rose-cut diamond spacers, to the grooved shoulders. Estimated total diamond weight 2cts, principal diamonds estimated H-I colour SI2-P1 clarity. 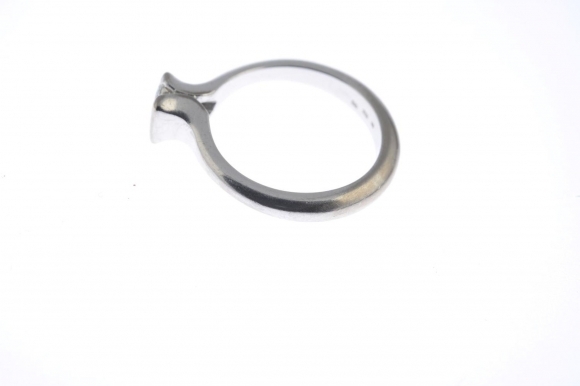 Ring size M1/2. Weight 4.1gms. 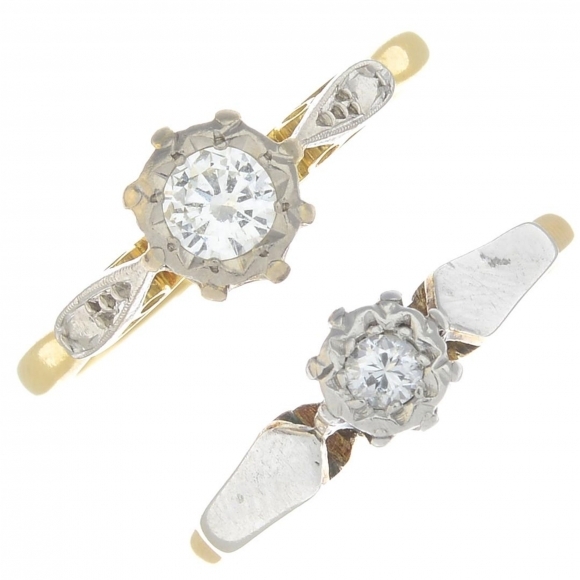 A mid 19th century gold and silver diamond dress ring. Designed as two old-cut diamond rows, with similarly-cut diamond terminals and rose-cut diamond spacers, to the grooved shoulders. Estimated total diamond weight 2cts, principal diamonds estimated H-I colour SI2-P1 clarity. 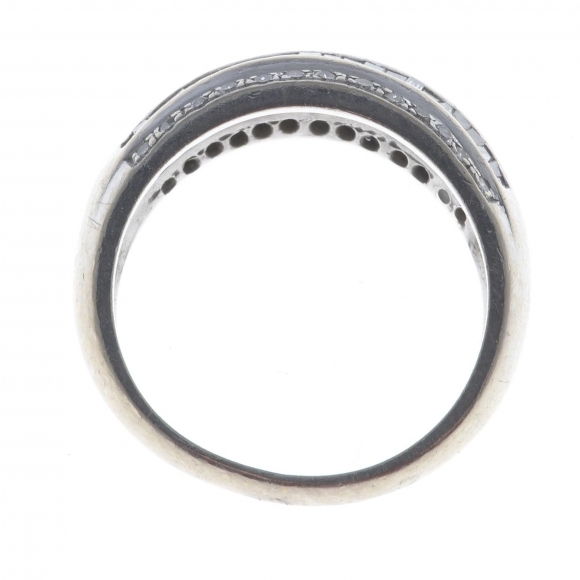 Ring size M1/2. Weight 4.1gms. 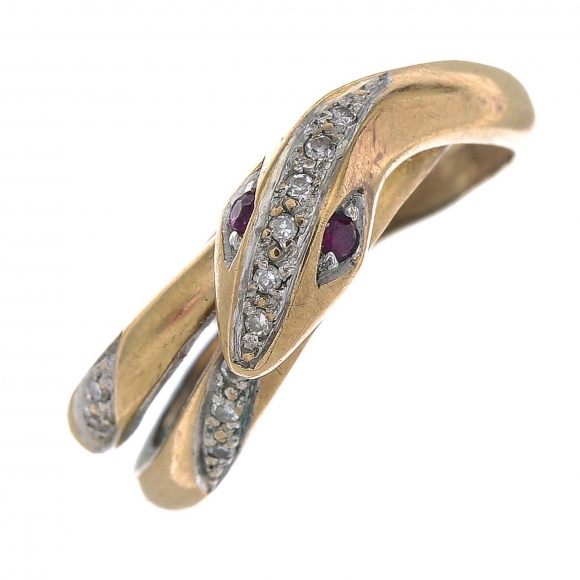 Lot 16 A ruby and diamond snake ring. 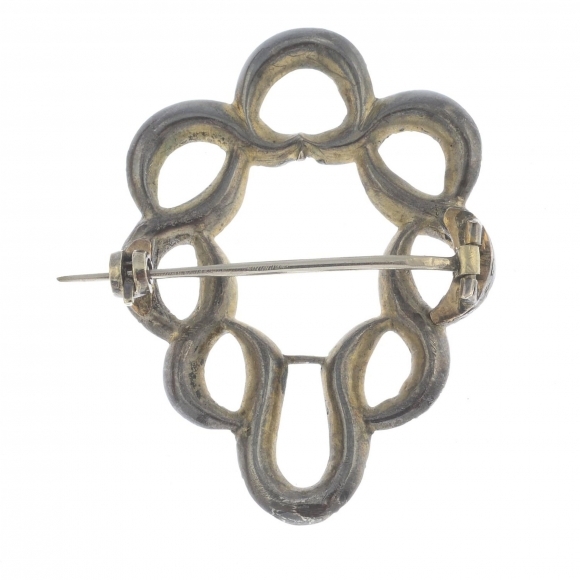 Designed as a coiled snake, with graduated single-cut diamond line crest and highlights. Estimated total diamond weight 0.10ct. Ring size K. Weight 3.9gms. 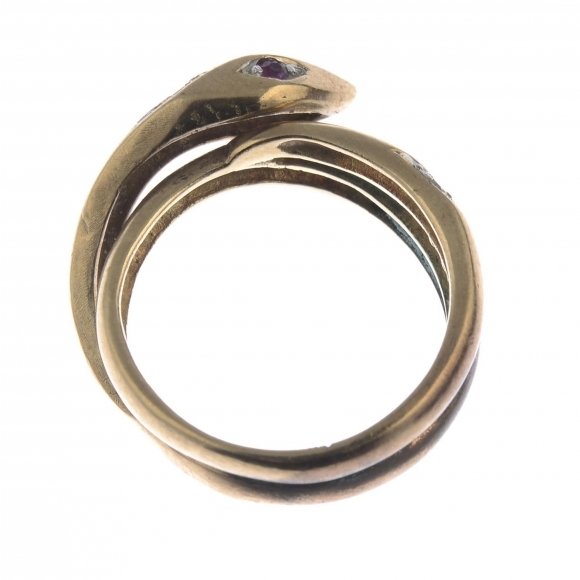 A ruby and diamond snake ring. 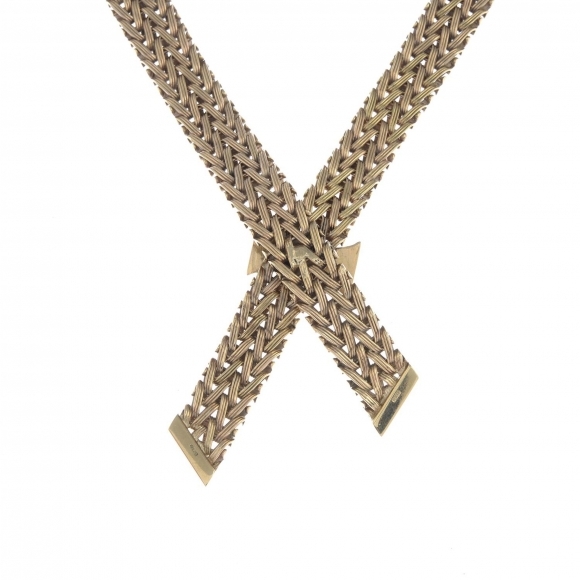 Designed as a coiled snake, with graduated single-cut diamond line crest and highlights. Estimated total diamond weight 0.10ct. Ring size K. Weight 3.9gms. Lot 17 A late Georgian silver garnet brooch. Of wreath design, comprising two overlapping undulating calibre-cut garnet lines. Length 4cms. With case. A late Georgian silver garnet brooch. Of wreath design, comprising two overlapping undulating calibre-cut garnet lines. Length 4cms. With case. 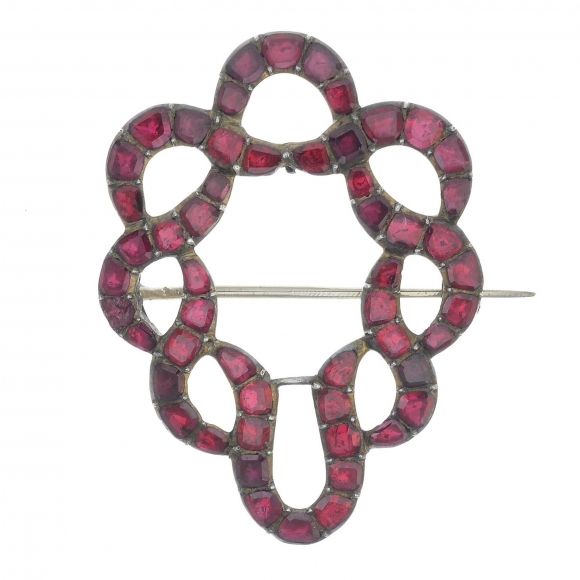 Lot 18 An early 20th century ruby and diamond brooch. 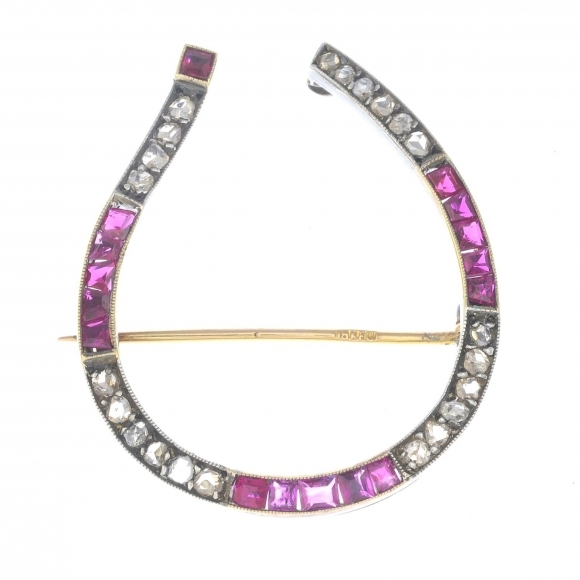 Designed as a stylised horseshoe, with alternating rose-cut diamond and calibre-cut ruby lines. Length 4cms. Total weight 5.9gms. An early 20th century ruby and diamond brooch. 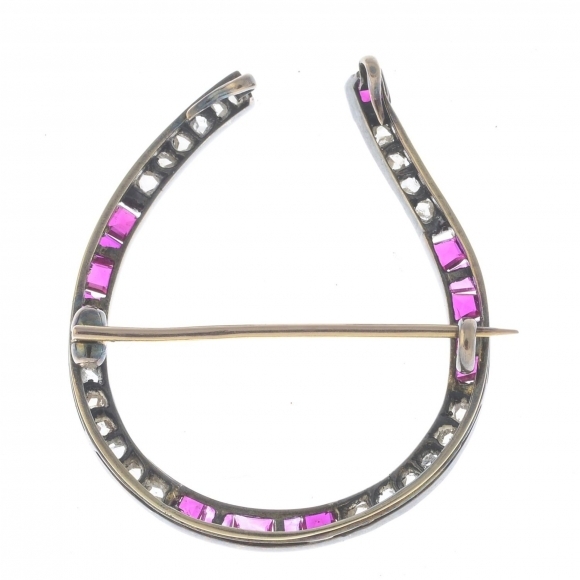 Designed as a stylised horseshoe, with alternating rose-cut diamond and calibre-cut ruby lines. Length 4cms. Total weight 5.9gms. 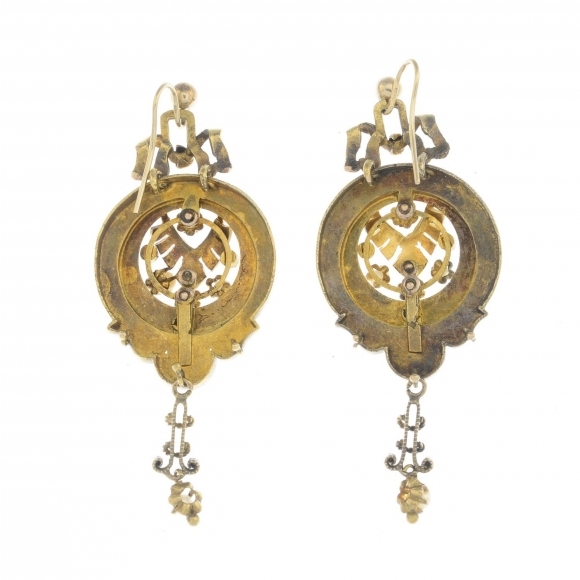 Lot 19 Two pairs of earrings. 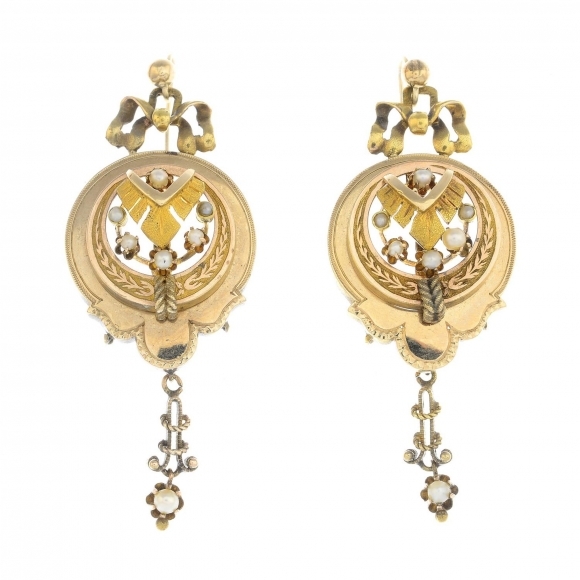 To include a pair of late Victorian drop earrings each designed as a circular-shape panel with seed pearl highlights and openwork fringe, together with a further pair of earrings. Length 3.8 and 4cms. Weight 15.5gms. Two pairs of earrings. 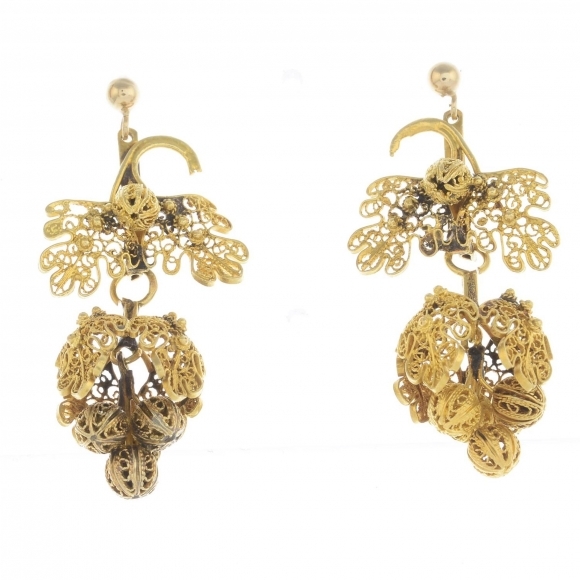 To include a pair of late Victorian drop earrings each designed as a circular-shape panel with seed pearl highlights and openwork fringe, together with a further pair of earrings. Length 3.8 and 4cms. Weight 15.5gms. Lot 20 An 18ct gold diamond necklace. 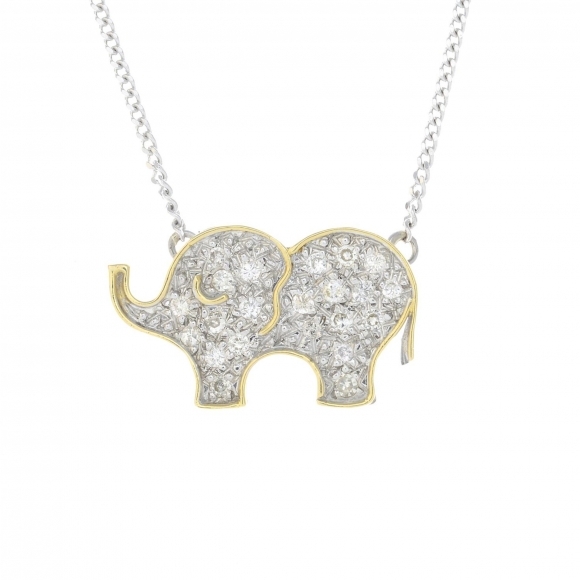 Of bi-colour design, the pave-set diamond elephant panel, with integral curb-link back-chain. Estimated total diamond weight 0.35ct. Hallmarks for London, 1977 and Sheffield, 2003. Length 48cms. Weight 6.1gms. An 18ct gold diamond necklace. 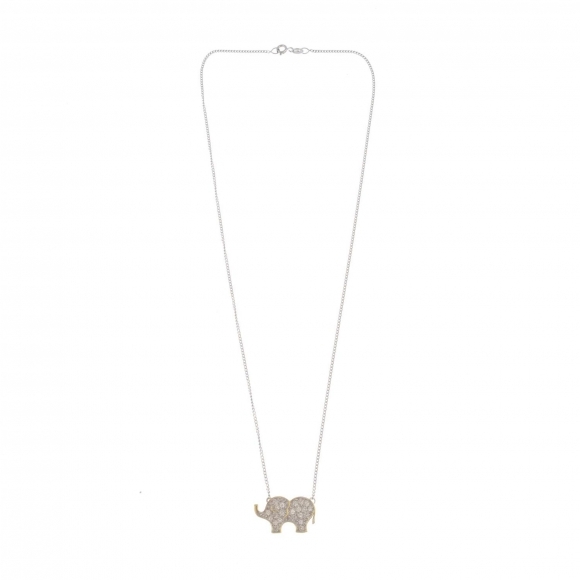 Of bi-colour design, the pave-set diamond elephant panel, with integral curb-link back-chain. Estimated total diamond weight 0.35ct. Hallmarks for London, 1977 and Sheffield, 2003. Length 48cms. Weight 6.1gms. 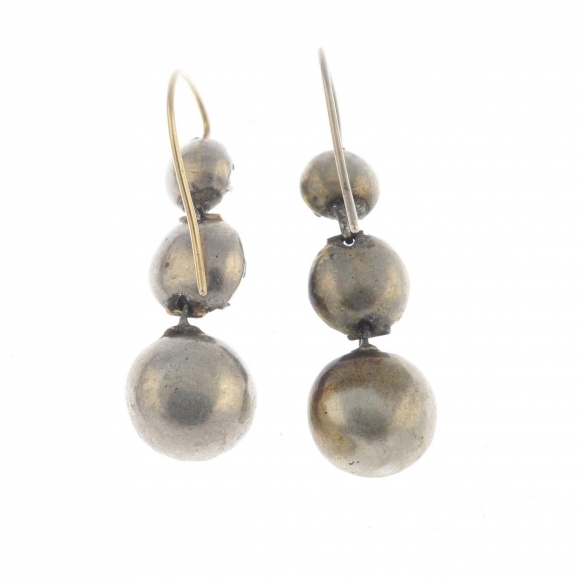 Lot 21 A pair of Georgian silver, foil back paste earrings. 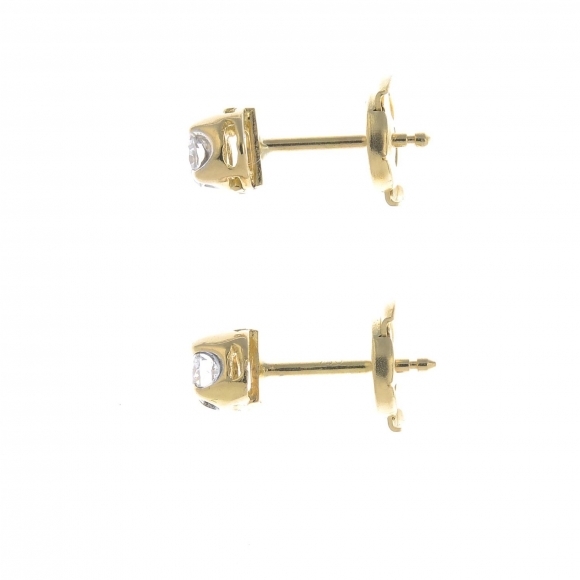 Each designed as a graduated foil back paste articulated drop, with hook fittings. Length 2.8cms. Weight 7.2gms. A pair of Georgian silver, foil back paste earrings. 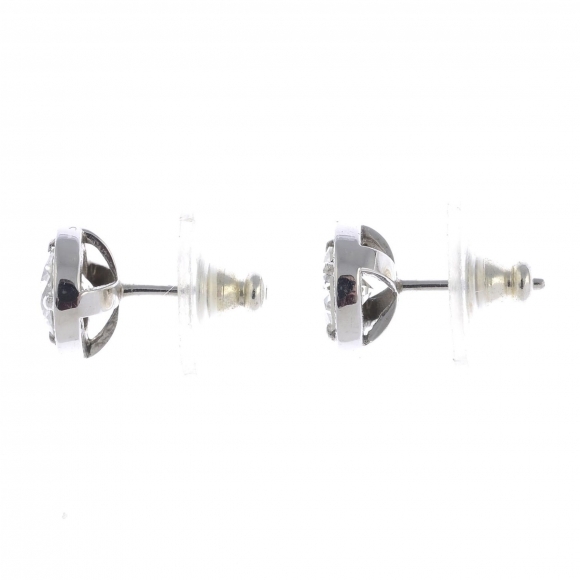 Each designed as a graduated foil back paste articulated drop, with hook fittings. Length 2.8cms. Weight 7.2gms. 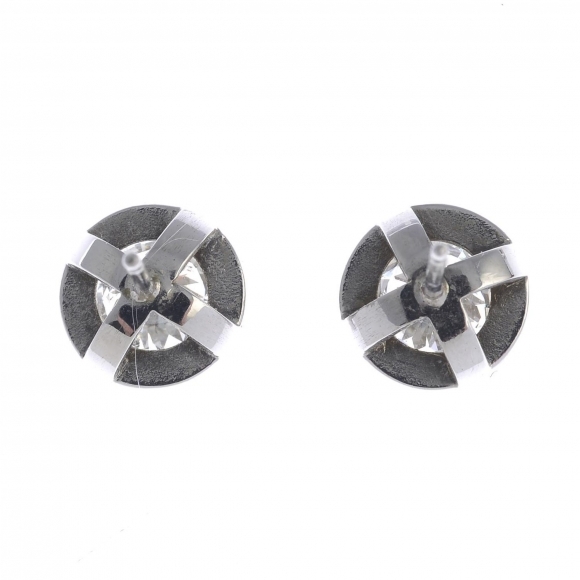 Lot 22 A pair of brilliant-cut diamond stud earrings. Estimated total diamond weight 0.30ct, H-I colour, VS2-SI1 clarity. Marks to indicate 18ct gold. Weight 1.7gms. 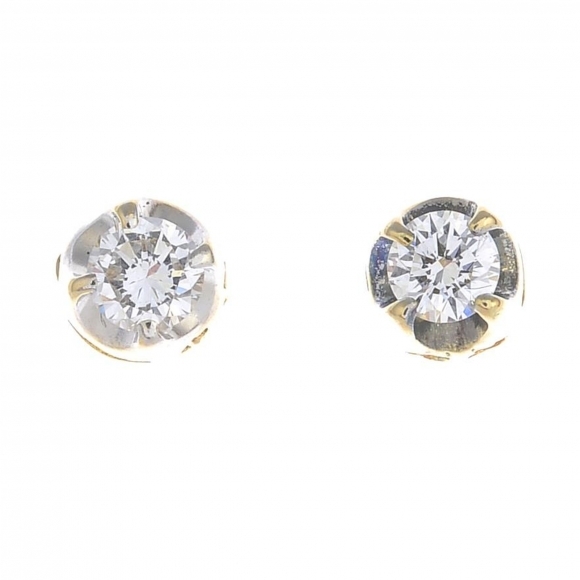 A pair of brilliant-cut diamond stud earrings. Estimated total diamond weight 0.30ct, H-I colour, VS2-SI1 clarity. Marks to indicate 18ct gold. Weight 1.7gms. 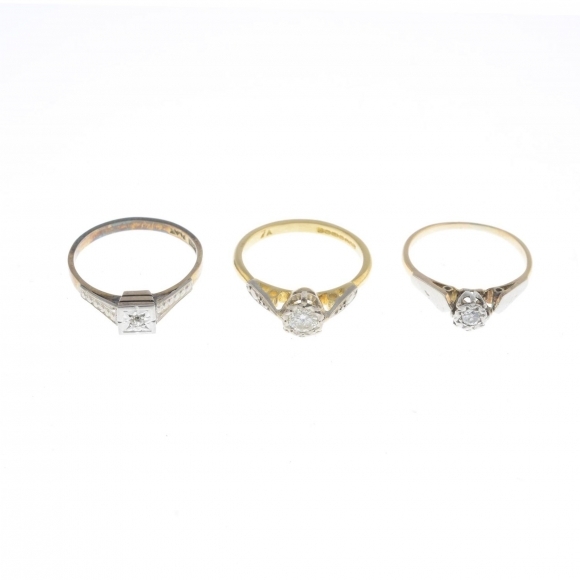 Lot 23 Three diamond single-stone rings. Each designed as an illusion-set diamond, with raised shoulders. Estimated total diamond weight 0.35ct. One with hallmarks for 18ct gold. Total weight 6.5gms. 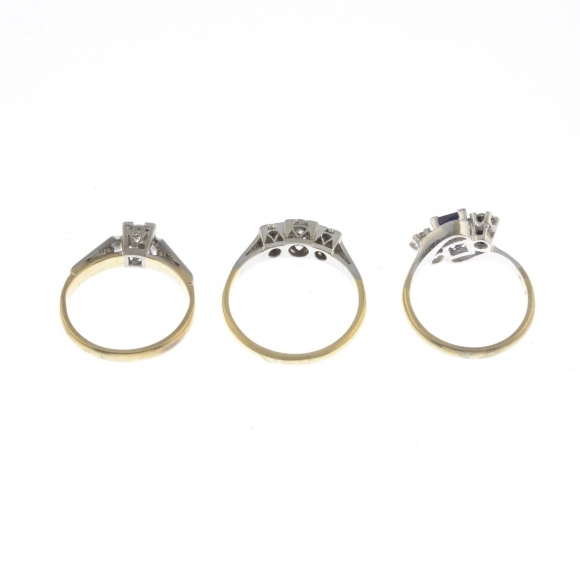 Three diamond single-stone rings. Each designed as an illusion-set diamond, with raised shoulders. Estimated total diamond weight 0.35ct. One with hallmarks for 18ct gold. Total weight 6.5gms. 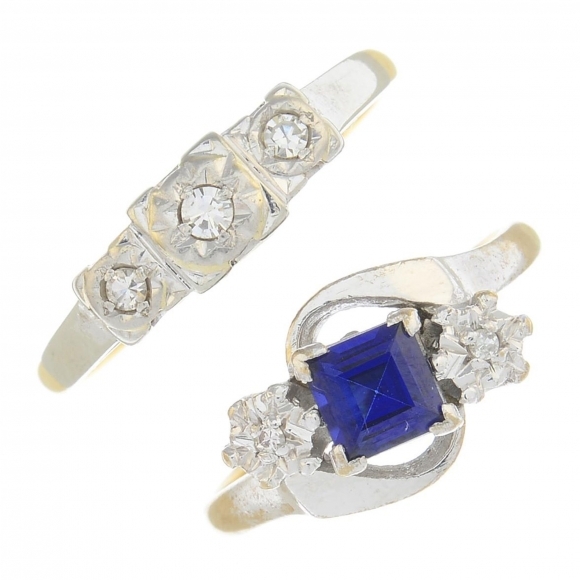 Lot 24 Two diamond and gem-set rings. 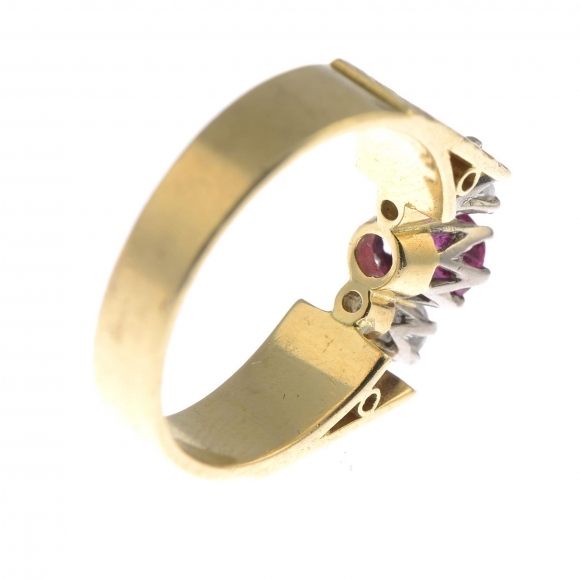 To include an Edwardian 18ct gold ring, designed as an old-cut diamond star-set to the tapered band, together with a circular-shape ruby and old-cut diamond five-stone ring. Estimated total diamond weight 0.30ct. One with hallmarks for Birmingham, 1901. Total weight 11.2gms. 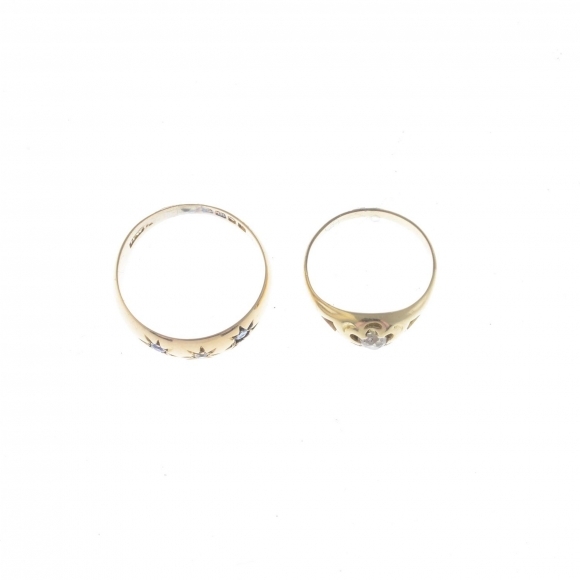 Two diamond and gem-set rings. 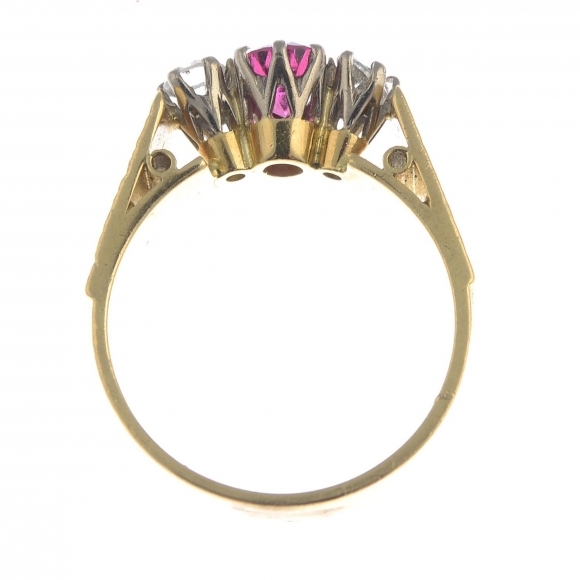 To include an Edwardian 18ct gold ring, designed as an old-cut diamond star-set to the tapered band, together with a circular-shape ruby and old-cut diamond five-stone ring. Estimated total diamond weight 0.30ct. One with hallmarks for Birmingham, 1901. Total weight 11.2gms. Lot 25 A selection of gem-set jewellery. 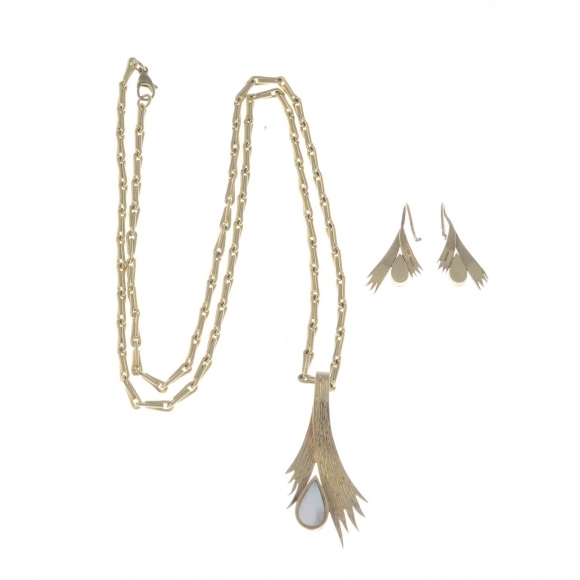 To include a 9ct gold mother-of-pearl textured pendant suspended from a fancy-link chain, together with a pair of 9ct gold matching earrings. Pendant and earrings with hallmarks for Birmingham. Chain stamped 9K. Length of pendant 4.5cms. Length of earrings 2.8cms. Length of chain 60cms. Total weight 28.1gms. With case. A selection of gem-set jewellery. 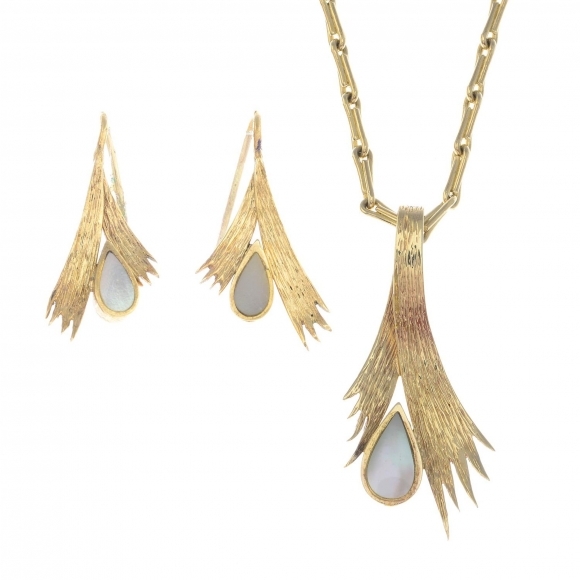 To include a 9ct gold mother-of-pearl textured pendant suspended from a fancy-link chain, together with a pair of 9ct gold matching earrings. Pendant and earrings with hallmarks for Birmingham. Chain stamped 9K. Length of pendant 4.5cms. Length of earrings 2.8cms. Length of chain 60cms. Total weight 28.1gms. With case. 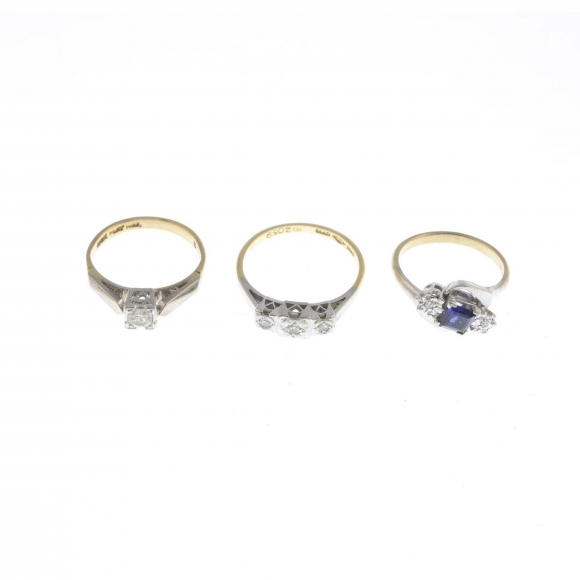 Lot 26 Three diamond and gem-set rings. To include a sapphire and diamond three-stone ring, a diamond single-stone ring, together with a diamond three-stone ring. Estimated total diamond weight 0.30ct. Marks to indicate 18ct gold. Weight 9.6gms. 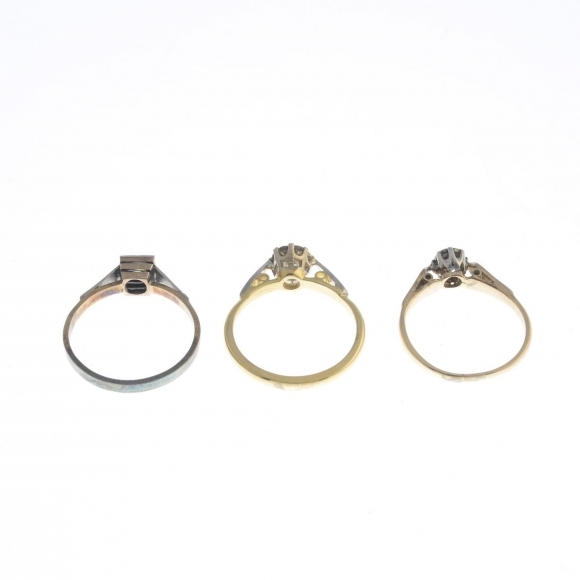 Three diamond and gem-set rings. To include a sapphire and diamond three-stone ring, a diamond single-stone ring, together with a diamond three-stone ring. Estimated total diamond weight 0.30ct. Marks to indicate 18ct gold. Weight 9.6gms. 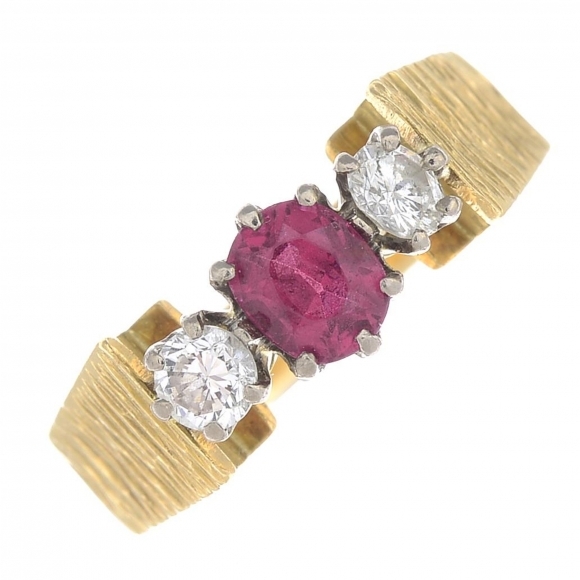 Lot 28 An 18ct gold ruby and diamond ring. The oval-shape ruby, with brilliant-cut diamond sides, to the textured shoulders and plain band. Estimated total diamond weight 0.30ct, H-I colour, SI clarity. Hallmarks for Birmingham, 1975. Ring size M. Weight 5.5gms. An 18ct gold ruby and diamond ring. The oval-shape ruby, with brilliant-cut diamond sides, to the textured shoulders and plain band. Estimated total diamond weight 0.30ct, H-I colour, SI clarity. Hallmarks for Birmingham, 1975. Ring size M. Weight 5.5gms. 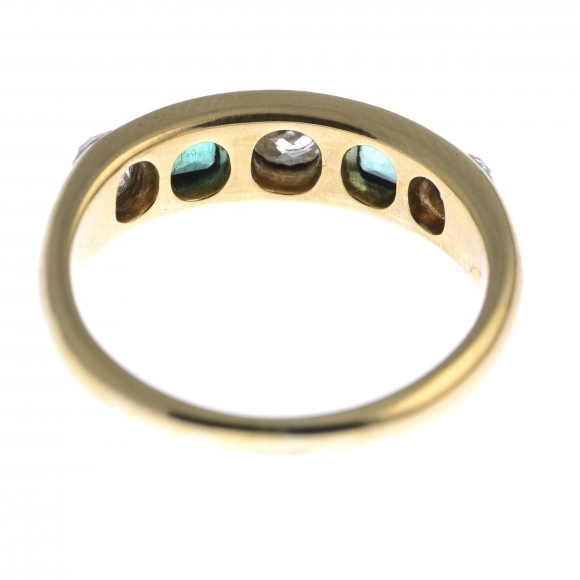 Lot 29 An Edwardian 18ct gold diamond and emerald five-stone ring. Designed as a graduated old-cut diamond line, with square-shape emerald spacers, inset to the tapered band. Estimated total diamond weight 0.40ct. Ring size N. Weight 4.6gms. 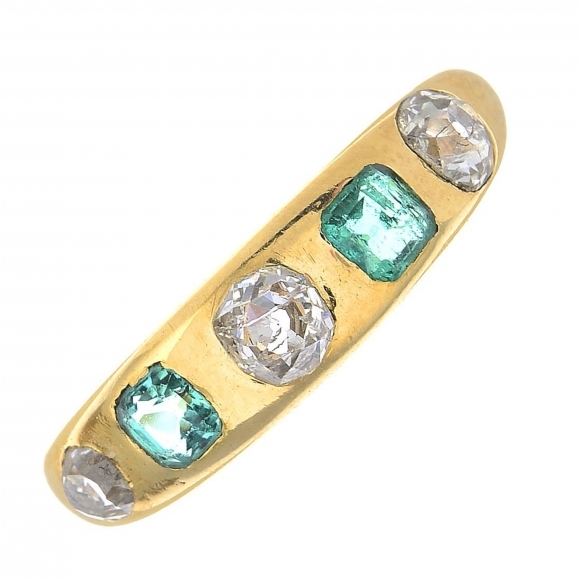 An Edwardian 18ct gold diamond and emerald five-stone ring. Designed as a graduated old-cut diamond line, with square-shape emerald spacers, inset to the tapered band. Estimated total diamond weight 0.40ct. Ring size N. Weight 4.6gms. 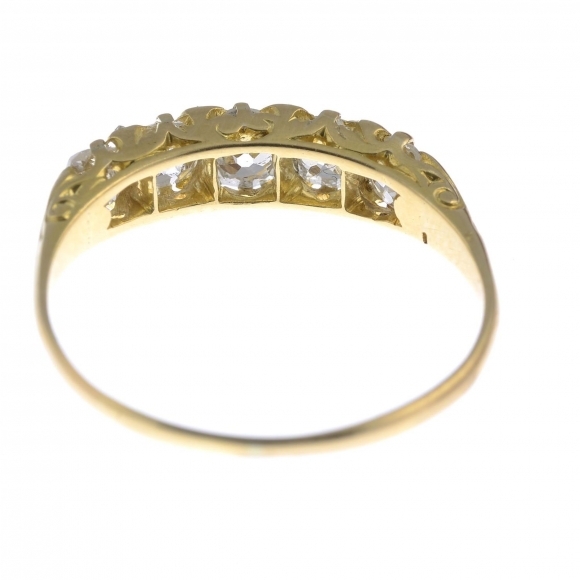 Lot 30 An 18ct gold diamond dress ring. The calibre-cut diamond lines, with brilliant-cut diamond line sides. Estimated total diamond weight 0.65ct. Hallmarks for London, 2007. Ring size N1/2. Weight 6.6gms. 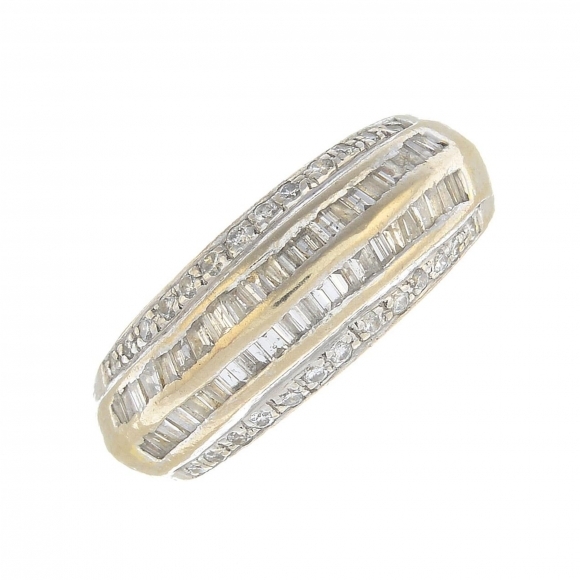 An 18ct gold diamond dress ring. The calibre-cut diamond lines, with brilliant-cut diamond line sides. Estimated total diamond weight 0.65ct. Hallmarks for London, 2007. Ring size N1/2. Weight 6.6gms. 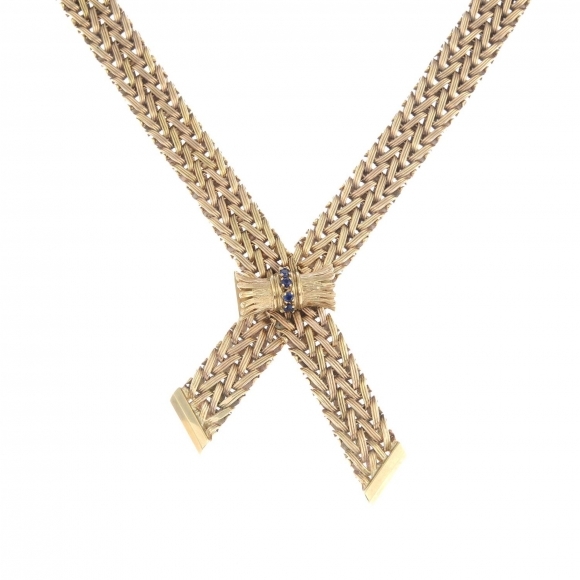 Lot 31 A 1970s 9ct gold sapphire necklace. Designed as grooved fancy-link overlapping chain, gathered to the circular-shape sapphire line accent textured highlight, with polished terminals and clasp. Maker's mark for Nathan Brothers. Hallmarks for Birmingham, 1974. Length 40cms. Weight 63.4gms. A 1970s 9ct gold sapphire necklace. 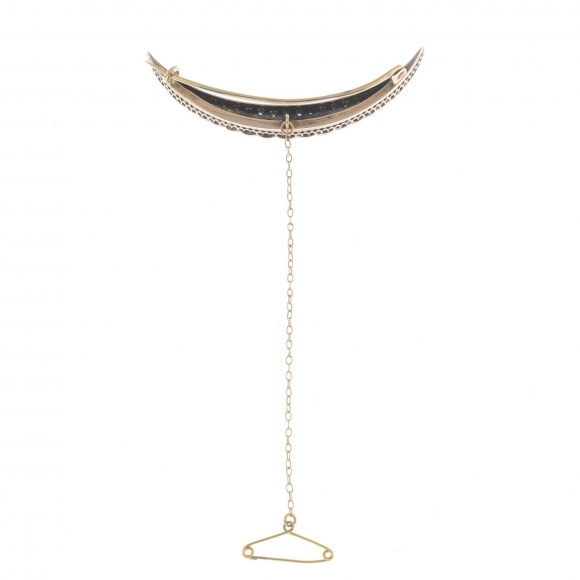 Designed as grooved fancy-link overlapping chain, gathered to the circular-shape sapphire line accent textured highlight, with polished terminals and clasp. Maker's mark for Nathan Brothers. Hallmarks for Birmingham, 1974. Length 40cms. Weight 63.4gms. 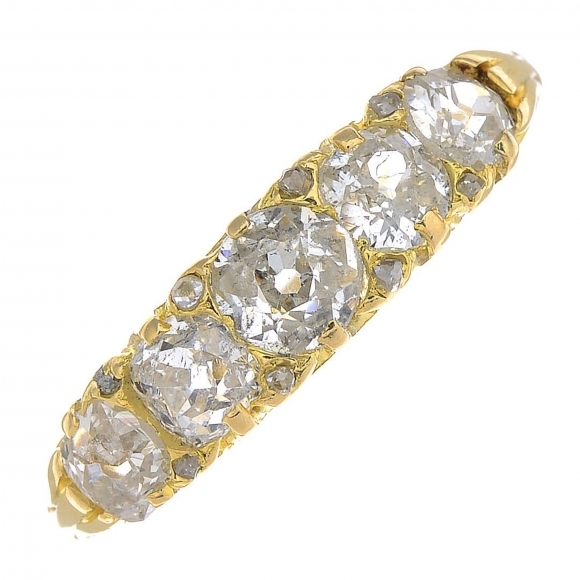 Lot 32 An 18ct gold diamond single-stone ring. 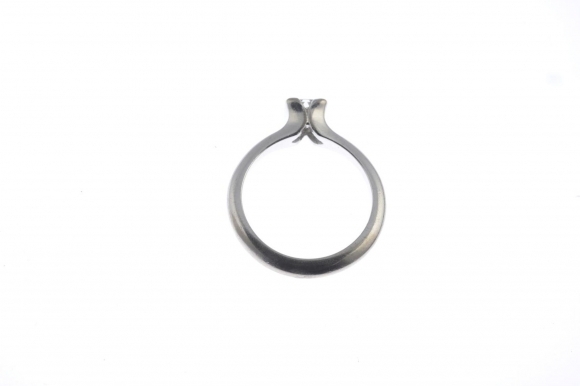 Designed as a square-shape diamond, with partial collet surround and tapered shoulders. Estimated diamond weight 0.35ct, H-I colour, SI clarity. Hallmarks for Birmingham. 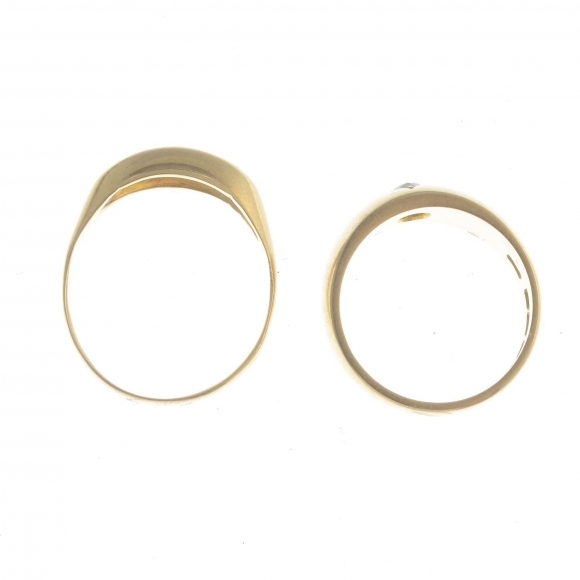 Ring size J. Weight 4.3gms. 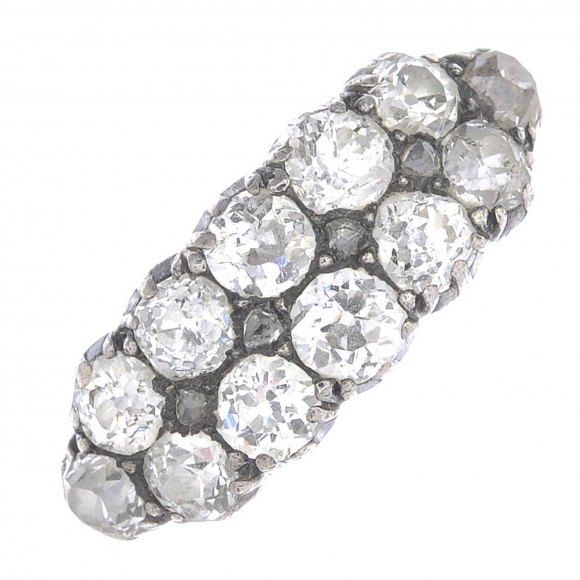 An 18ct gold diamond single-stone ring. 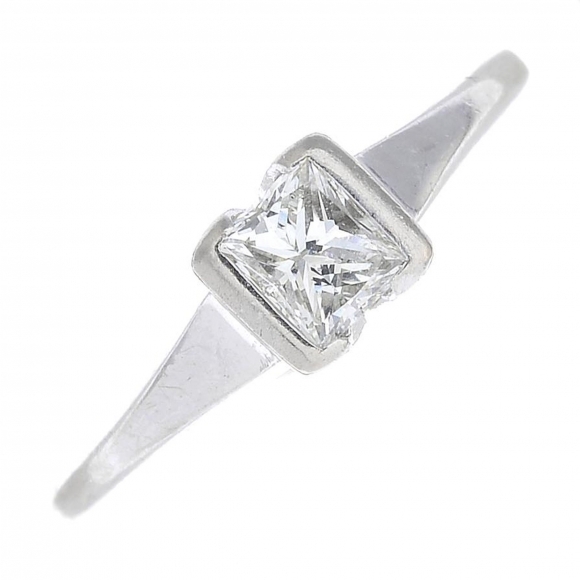 Designed as a square-shape diamond, with partial collet surround and tapered shoulders. Estimated diamond weight 0.35ct, H-I colour, SI clarity. Hallmarks for Birmingham. 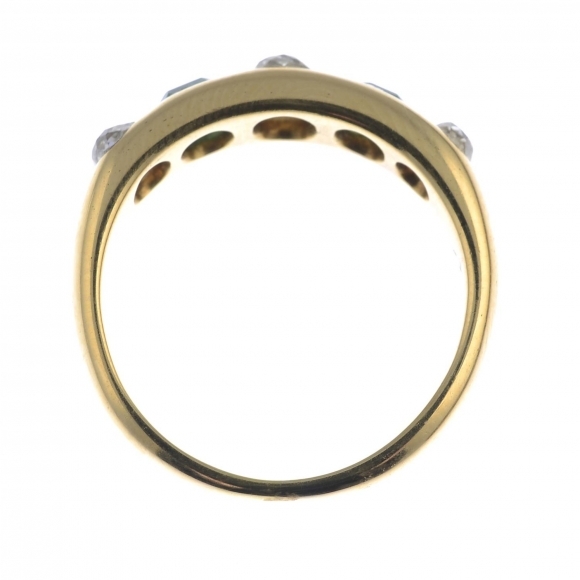 Ring size J. Weight 4.3gms. 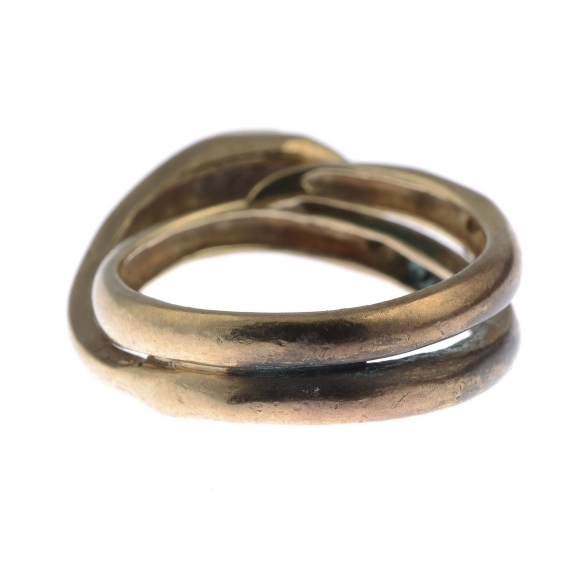 Lot 33 Two early 20th century gold diamond and gem-set rings. The first designed as a tapered band star-set with an old-cut diamond and circular-shape sapphire line, the second designed as an old-cut diamond with pierced geometric sides. Estimated total diamond weight 0.25ct. One with hallmarks for London, 1917. Weight 6.4gms. 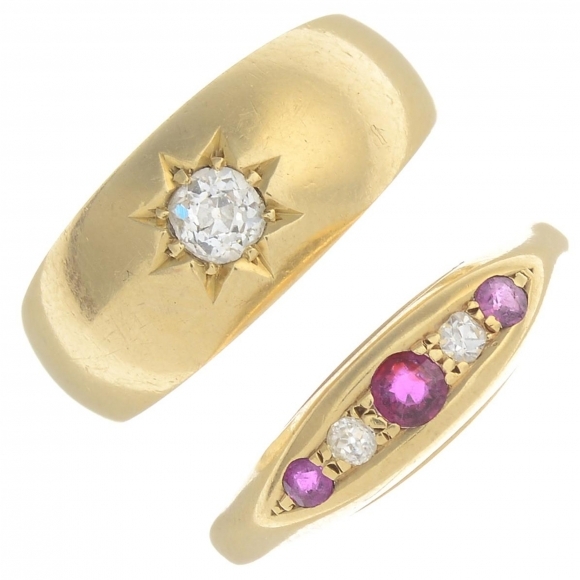 Two early 20th century gold diamond and gem-set rings. 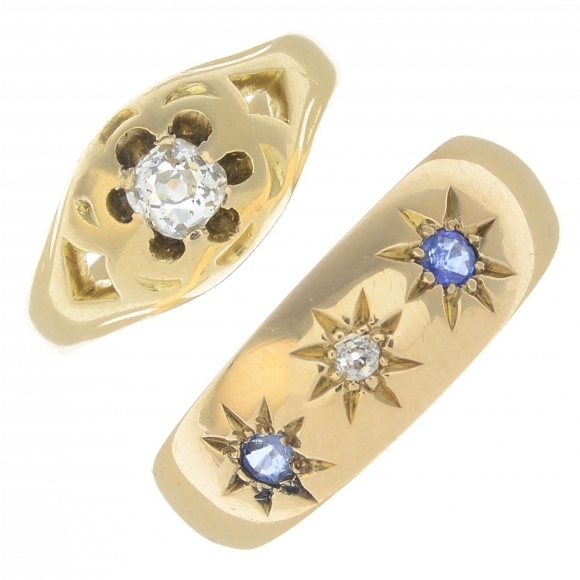 The first designed as a tapered band star-set with an old-cut diamond and circular-shape sapphire line, the second designed as an old-cut diamond with pierced geometric sides. Estimated total diamond weight 0.25ct. One with hallmarks for London, 1917. Weight 6.4gms.